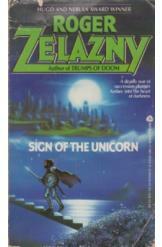 Sign of the Unicorn by Roger Zelazny, Sci Fi. Book is in good condition, all pages intact. The power to walk between the worlds - the greatest secret of the royal family of Amber - has been given to the forces of chaos by a traitor. In the midst of this cosmic disaster, Corwin must also deal with intrigue within his own family. Part of the Amber series.